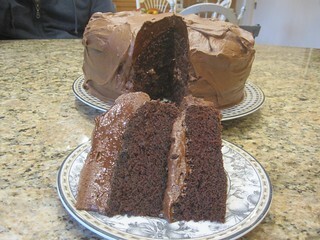 This cake was on the cover of the “All-Time Best Recipes” Collector’s Edition from Cook’s Illustrated. My one piece of advice is that you take the time to follow all of the steps as written. What I’ve found with Cook’s Illustrated is that every step and process has a very specific purpose. These people try a recipe 500 different ways in order to get the best result- so I try not to stray too much- especially when it comes to baking! This is just a great, basic, perfectly chocolaty, moist, delicious old-fashioned cake. 1. For the cake: Adjust the oven rack to middle position and heat oven to 350 degrees. Grease two 9-inch round cake pans, line with parchment paper, grease parchment, and flour pans. Combine chocolate cocoa, and hot water in medium heatproof bowl set over saucepan filled with 1 inch of barely simmering water and stir with heatproof rubber spatula until chocolate is melted, about 2 minutes. Add ½ cup sugar to chocolate mixture and stir until thick and glossy, 1 to 2 minutes. Remove bowl from heat; set aside to cool. 2. Whisk flour, baking soda, and salt together in medium bowl. Combine buttermilk and vanilla in small bowl. Using stand mixer fitted with whisk, whip eggs and egg yolks on medium-low speed until combined, about 10 seconds. Add remaining 1¼ cups sugar, increase speed to high, and whip until light and fluffy, 2 to 3 minutes. Replace whisk with paddle. Add cooled chocolate mixture to egg mixture and mix on medium speed until thoroughly combined, 30 to 45 seconds, scraping down bowl as needed. Add butter, 1 piece at a time, mixing about 10 seconds after each addition. Add flour in 3 additions, alternating with 2 additions of buttermilk mixture, mixing until incorporated after each addition (abut 15 seconds), scraping down bowl as needed (batter may appear curdled). Mix at medium-low speed until batter is thoroughly combined, about 15 seconds. Remove bowl from mixer and give batter final stir by hand. 4. For the frosting: Melt chocolate in heatproof bowl set over saucepan containing 1 inch of barely simmering water, stirring occasionally until smooth. Remove from heat and set aside. Meanwhile, melt butter in small saucepan over medium-low heat. Increase heat to medium, add sugar, corn syrup, vanilla, and salt and stir with heatproof rubber spatula until sugar is dissolved, 4 to 5 minutes. In bowl of sand mixer, combine melted chocolate, butter mixture, and cream and stir until thoroughly combined. 5. Place mixer bowl over ice bath and stir mixture constantly with rubber spatula until frosting is thick and just beginning to harden against bowl, 1 to 2 minutes (frosting should be 70 degrees). 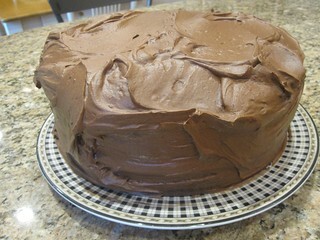 Fit stand mixer with paddle and beat frosting on medium-high speed until frosting is light and fluffy, 1 to 2 minutes. Using rubber spatula, stir until completely smooth.